Bethel Church, a controversial megachurch in California, said there is no truth in the accusation that it promotes New Age occultism by using "Destiny Cards," which critics likened to tarot cards. The 8,000-member church in Redding was accused of working with a Melbourne, Australia-based group known as Christalignment, which claims to have worked with many churches in that country to do such readings, but Bethel responded by saying that Christalignment is not formally affiliated with Bethel and nor does it use "Christian tarot cards." Bethel admitted the leaders of Christalignment, Ken and Jenny Hodge, are connected with several of their church members as the Hodges are the parents to church evangelist Ben Fitzgerald, and said the church leaders "have a value for what they are seeking to accomplish." "They (Christalignment) stand in agreement with the Scriptures that all occult practices (like tarot cards) have no place in the Kingdom and should not be used," Bethel said in a statement. Christ Alignment staff describe themselves as "trained spiritual consultants," and say on their website that they "draw from the same divine energy of the Christ spirit." "We practice a form of supernatural healing that flows from the universal presence of the Christ. We draw from the same divine energy of the Christ spirit, as ancient followers did and operate only out of the third heaven realm to gain insight and revelation," they say. Bethel said it reached out to the Hodges to respond to critics. "The Hodge's ministry is a form of outreach meant to share Jesus with those who have never met Him, or think they hate Him, or worse, that God hates them," the statement reads. "This practice is not what the Hodges do in church, in their devotional lives and Bible study, when making major life decisions, or when discipling people. It is not taught as the next great way of maturity, a secret new thing for young Christians, or an easy syncretism. This ministry is a way of getting people to stop and engage with fellow humans so that they might encounter the love of the Father and the truth of His Son Jesus Christ." Jenny Hodge wrote to Bethel, denying the accusation. "Over the last six years, we have developed a very successful tested method for ministering to thousands of new age people." The cards Christalignment uses are "not tarot nor remotely similar to tarot," she wrote. "We know tarot cards are very dangerous and highly discourage it. 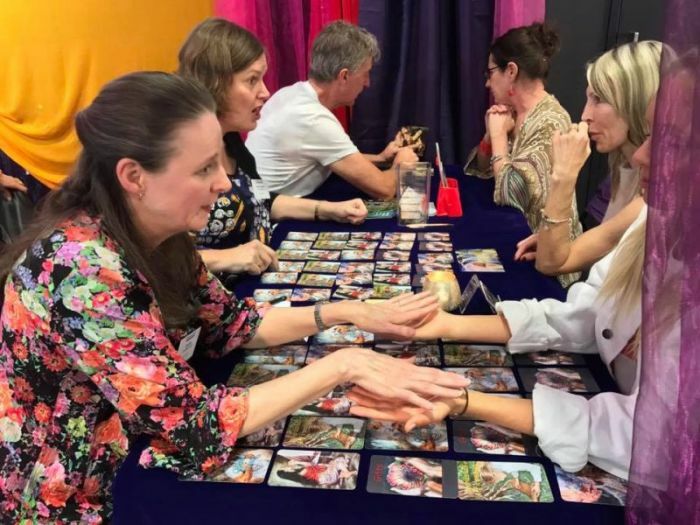 The tools we made help us lead people into deep God-encounters at our tables, and our aim at Christalignment is to attract tarot reading clients, people who are fully into new age practices, psychics, and witches. All of these people can immediately recognize that our cards are not tarot once they sit down at our tables." She added, "Card sets, including cards we made named "Psalm cards" with scriptures on them, address the gifting in a person's life. The color God is showing the person in a prayer encounter will speak to the person through the prophetic image on the front or meaning on the back. It's the same as when we give someone a prophetic painting, just much smaller. They are all non-predictive, but we call them destiny cards as we believe that giftings and callings given by God for people are certainly part of their destiny."